Florence is a city that is also a museum. You could spend days walking around and still not see most of the city's impressive art and architecture. For most visitors, there are a few highlights that they try to visit over several days, but if you have more time, it's worth looking beyond the highlights and finding the many hidden gems that Florence has to offer. Below is a list of just some of the popular sights around the city. The Uffizi is renowned as one of the most impressive art museums in the world. It's diverse and impressive collection is a must-see, even for those who are not art enthusiasts. The museum is located in a large building that runs along the river and once one of the Medici palaces that was designed to hold government offices, scientific studies, and art. Between March and October tickets are €20 / reduced €10. Other times, the tickets are €12/ reduced €6. A combined ticket that includes entry to the Uffizi, Palazzo Pitti, and the Boboli Gardens is €38 / reduced €21 between March and October and €18/ reduced €11 at other times. Additional information is available on the official website. The Pitti Palace has an impressive museums, art galleries, and royal apartments. The Palace was built in the 15th century and was purchased in 1550 by Eleonora da Toledo, the wife of the Grand Duke Cosimo I de'Medici, making it an official residence of the family. It was renovated and made bigger, with many of its current decorations dating back to the 17th century. Between March and October tickets are €16 / reduced €8. Other times, the tickets are €10 / reduced €5. A combined ticket that includes entry to the Uffizi, Palazzo Pitti, and the Boboli Gardens is €38 / reduced €21 between March and October and €18 / reduced €11 at other times. Additional information is available on the official website. The Boboli Gardens are popular with locals and tourists alike. This open air musuem is located just behind the Pitti Palace and it offers a wonderful retreat from the city. The original part of the gardens dates back to the 16th century and reflects the Renaissance style. The gardens have been expanded and redesigned and now visitors will find many ponds, fountains, and temples. Between March and October tickets are €10 / reduced €5. Other times, the tickets are €6 / reduced €3. 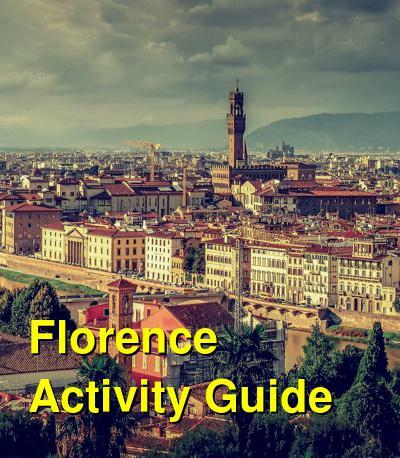 A combined ticket that includes entry to the Uffizi, Palazzo Pitti, and the Boboli Gardens is €38 / reduced €21 between March and October and €18 / reduced €11 at other times. Additional information is available on the official website. 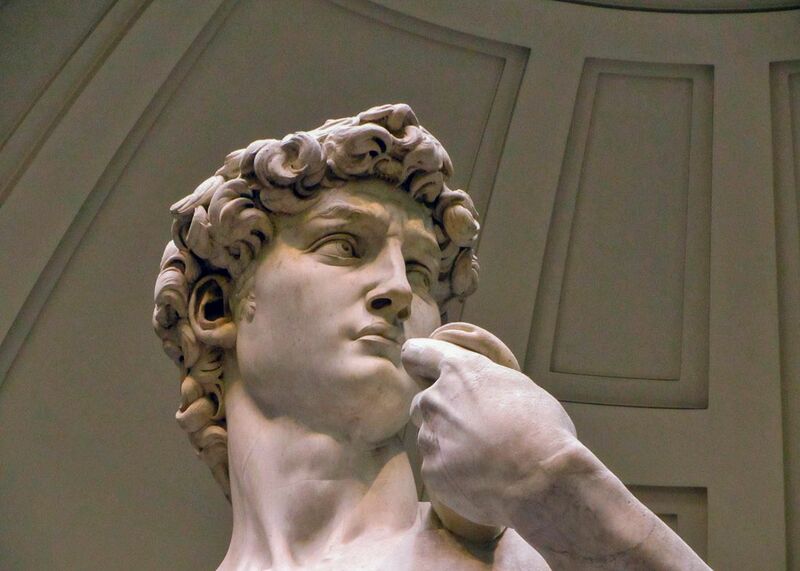 This art museum is home to the famous sculpture by Michelangelo, David. It also has other works by Michelangelo as well as paintings by other artists who lived between 1300 and 1600. The museum is smaller than the Uffizi, but it also houses an impressive collection and is the second most visited art museum in Italy, after the Uffizi. Most visitors come specifically to see the David, but if you take the time to explore the rest of the museum you'll enjoy a fascinating wealth of work with far fewer crowds. Tickets and additional information are available on their website. Prices are €8 / €4 reduced. This palace and museum was once used as a prison. It eventually opened in 1865 as a museum and now houses the largest Italian collection of Gothic and Renaissance sculptures. The work ranges from the 14th to the 17th century and you'll see pieces by Donatello, Luca della Robbia, Verrocchio, Michelangelo, and Cellini. Visit the official website for additional information. Tickets are €9 / reduced €4.50. This impressive palace is filled with beautiful rooms and galleries. The Medici family ruled the republic from this palace and made decisions regarding its government, architecture, and design. The Palace is located in the Piazza della Signoria and now offers a glimpse into several different periods in Italian history. With Roman ruins, a Medieval fortress, and Renaissance paintings, this museum spans many centuries. It's a truly unique museum, and for many visitors it quickly becomes a favorite in Florence. There are free tours available, but you should sign up early. You can also return in the evening for a great view of the sunset from the rooftop. San Miniato al Monte is a short climb or bus ride beyond Florence's famous viewpoint, Piazzale Michelangiolo. It's architecture and design is influenced by both Classical Roman and Byzantine styles and the green and white marble facade is quite impressive. Inside there's a beautiful mosaic floor and painted wooden ceiling. The marble pulpit in the chapel is from the 12th century. Visit the official website for additional information. This iconic complex in Florence is a must see for any visitor. The complex includes the Cathedral of Santa Maria del Fiore, Brunelleschi's Dome, Giotto's Bell Tower, the Baptistry of San Giovanni, the Crypt of Santa Reparata and the Opera Museum. It offers a glimpse into the area's rich architectural and religious history. Cathedral of Santa Maria del Fiore: This cathedral was designed by Arnolfo di Cambio. Finished in the 15th century, it's the third largest church in the world (153 meters long, 90 meters wide and 90 meters high). Brunelleschi's Dome: The cathedral's dome was designed by Filippo Brunelleschi and built between 1418 and 1434. The frescoes on the inner shell of the dome were done by Giorgio Vasari and Federico Zuccari between 1572 and 1579. They were later restaurants in 1978 and 1994. The Baptistry of San Giovanni: This 12th century baptistery has beautiful mosaics on its inside and an impressive marble facade on the outside. The detailed bronze panelled doors were created by Ghiberti and are worth the visit alone. The Museo dell'Opera del Duomo lets you see more detailed items and is worth visiting as well. Giotto's Bell Tower: This Bell Tower is considered to be one of the most beautiful in Italy. It stands 84.7 meters tall and was originally begun by Giotto in 1334. After his death, Andrea Pisano continued the work while Alberto Arnaldi and others worked on the carvings. Crypt of Santa Reparata: The old basilica of Santa Reparata was discovered during an archaeological dig between 1965 and 1973 and confirmed the presence of early Christianity in Florence. It served as a major Christian complex and there are numerous gravestones here including the tombs of Lando di Giano (died in 1353) and Niccolo Squarcialupi (died in 1313), as well as Giovanii Di Alamanno de' Medici (died in 1352). Opera Duomo Museum: This museum houses the impressive works of Arnolfo, Ghiberti, Donatello, Luca della Robbia, Antonio Pollaiolo, Verrocchio, Michelangelo. The Medici family church was designed by Brunelleschi and Michelangelo was commissioned to create the chapel, named the New Sacristy. The chapel was never completed but the work that was finished is considered one of the world's most impressive marble works. Santa Croce is a church and mausoleum that houses a wide variety of art including the frescoes of Cappella Bardi, Cappella Peruzzi, and Cappella Baroncelli. In the mausoleum you'll find the tombs of Michelangelo, Galileo, Ghiberti, Gioacchino Rossini, and Machiavelli. Tickets are €8 / reduced €6 and are available for purchase online. This church is another impressive representation of architecture and art. Inside there are frescoes by Masaccio, Giotto, Domenico Ghirlandaio, Lippi, Paolo Uccello, and Andrea di Bonaiuto. The marble pulpit is designed by Brunelleschi. This square dates back to the 14th century and today it serves as a popular social hang out for locals and tourists alike. There are several significant buildings and monuments in the square including the Palazzo Vecchio, which houses the city's government. The Uffizi and the Loggia dei Lanzi are found here and at the center of the square is the Neptune Fountain. This is the most popular viewpoint looking out on Florence and it's a must see for everyone. It can get crowded with tourist buses during the peak seasons, but late in the day you might find it a bit more relaxing. The sunset is particularly impressive and makes for a great photograph. The view takes in Ponte Vecchio, Palazzo Vecchio, Santa Croce, and the Duomo. It's relatively easy to walk here, or buses 12 and 13 make the trip. Just beyond the viewpoint is the church of San Miniato al Monte. Ponte Vecchio is one of the most widely recognized landmarks in Florence. The bridge connects the two sides of the Arno, and it has been the home to many craftsmen through the years. 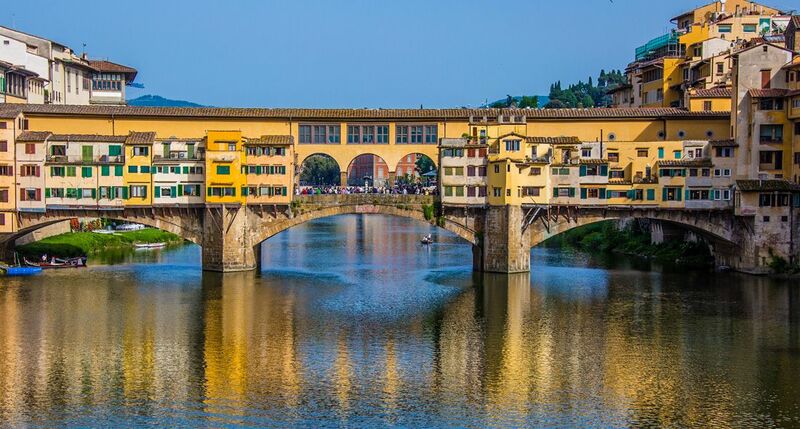 The bridge was commissioned by the Medici and designed by Vasari, and today you'll see many shops along it. For a change of pace, head over to Mercato Centrale, which is Florence's large outdoor food market. The stalls line the streets and sell everything from knickknacks and cheap souvenirs to fresh herbs and produce. If you're looking for some interesting souvenirs, there are some great olive oils and sweets for sale as well. The market is located between Via dell'Ariento, Via Sant'Antonino, Via Panicale, and Piazza del Mercato Centrale. The market dates back to the late 19th century and was designed by Giuseppe Mengoni.